1-CD with 12-page booklet, 12 tracks. Playing time approx. 70 mns. 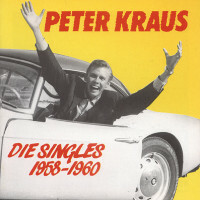 Peter Kraus - Die SinglesIf Peter Kraus has earned the reputation of a rock'n' roll singer, it goes back especially to the years 1957 and 1958. 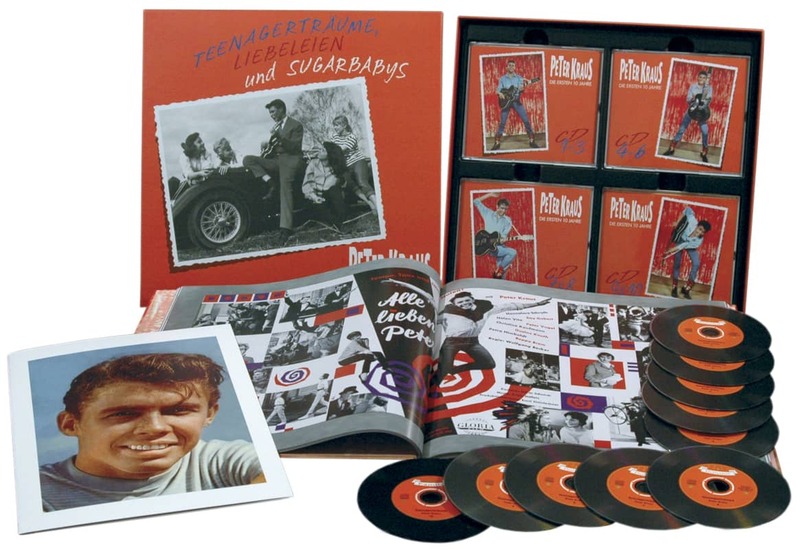 When Elvis Presley just left show business to drive tanks in Germany, Polydor producer Gerhard Mendelson plundered the Presley catalogue to establish his pupil Kraus - and later Ted Herold - in the hit market. Gerhard 'Mosche' Mendelson (1913 - 14 March 1976) from Berlin, Austria, had now set himself the task of launching young stars in his Vienna studio in addition to looking after Austrian pop singers. The current US charts offered an excellent area for local producers who wanted to poach in foreign territories. 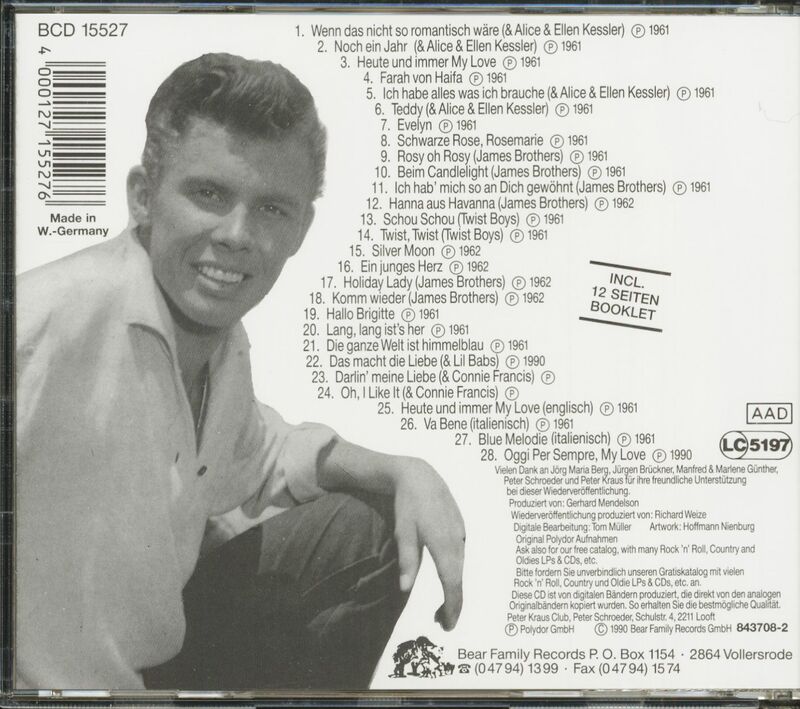 In addition to Presley, Gene Vincent, Jackie Wilson, Buddy Knox, Paul Anka and others had provided plenty of templates. There was a market for these records with copies of American titles. Example Peter Kraus: Liebelei (Butterfly), Teddy Bear (Teddy Bear), Make yourself beautiful (Treat Me Nice), Hafen-Rock (Jailhouse Rock), Just like back then (Since I Met You Baby), Rosmarie (Reet Petite), Hula Baby (Hula Love). 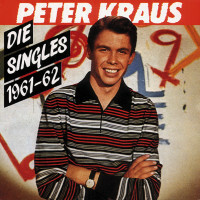 The closest to Peter Kraus was actually the Canadian child star Paul Anka, whose Diana he also sang after. Anka was no more a rock'n' roll singer than Kraus, in whose interpretation everything always became a hit. After all, pop culture reached the previously immune strata of German society through him, albeit with a restrained dynamic. "Rock'n' Roll in homoeopathic dilution", the WDR amused itself in a retrospective television program about this music, which however led to the fact that rock'n' roll was gradually no longer used as a swearword in the Federal Republic. 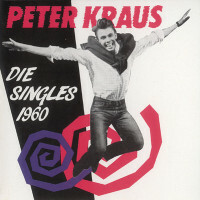 The term was even used in German: "Peter Kraus playing rock scooter". 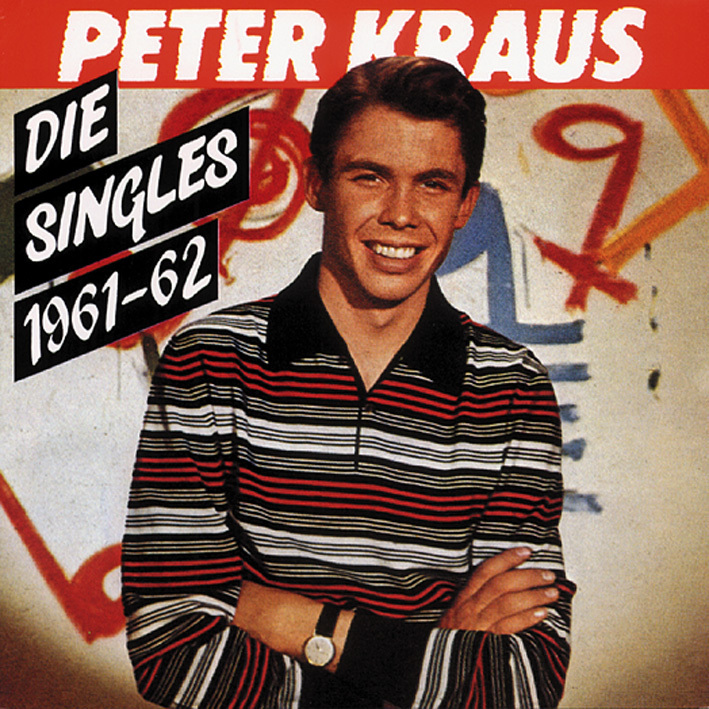 And they showed understanding for the youth represented by Peter Kraus. The'New Leaf': "He is as modern as his whole generation, who grew up in breeches instead of the uniforms of the air force helpers". Fashion played an important role in pop culture from the outset. Leather jackets and jeans were not only clothes, but symbols with which one could already show oneself externally as inappropriate. But to dismiss rock'n' roll now only as fashion, as happened in the media of the Federal Republic, corresponded to the desire to get the misunderstood phenomenon under control. 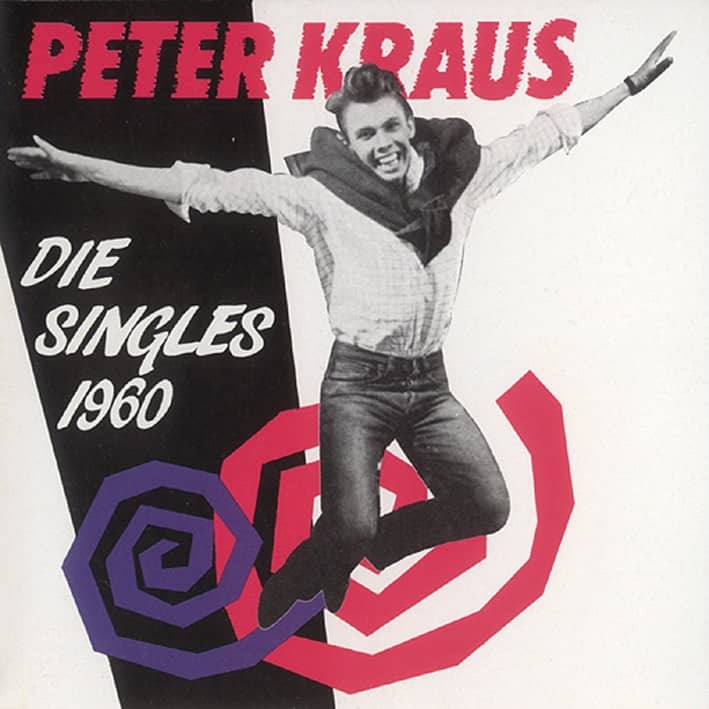 Peter Kraus - Die SinglesThen it belonged to depict dance steps to rock'n' roll in magazines. And that included a fast-moving teen fashion. Film actors such as Marlon Brando and James Dean set an example by making the T-shirt socially acceptable. Brando had already shown it in'Endstation Sehnsucht'. In'The Savage' he made it the symbol of the rebel. And in'for they know not what they do' James Dean did it like him by casually wearing a leather jacket over the white shirt. There were consequences: In'Bravo' a James Dean jacket was advertised ("He preferred to wear the combined leather cardigan in Hollywood cut. He sometimes dipped them in cognac"), and a sweater called'Peter-Kraus-Coll' was added for pop fans. 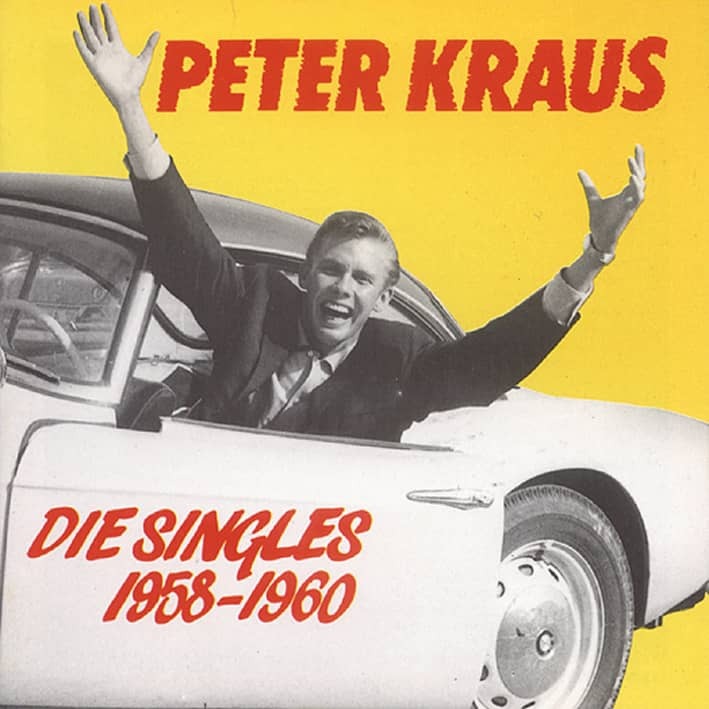 The rock'n' roll seemed to be a step in the right direction for Peter Kraus because he had made a name for himself in this field two years earlier. 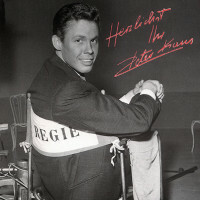 With his Elvis and Bill Haley songs rehearsed at home, he had performed in 1956 in front of a full hall in a competition of the Munich'Abendzeitung'. cticed for the performance with Hugo Strasser, whose orchestra accompanied him that evening. This is how the result was programmed. 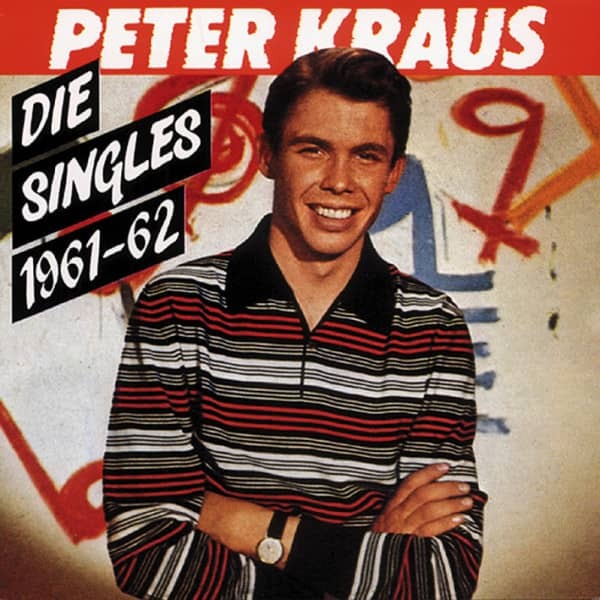 Peter Kraus gave the rock'n' roll star on stage. And the crowd raged. Three times he had to repeat the Rock-A-Beatin boogie. The whole thing had been announced as a jazz concert in the Deutsches Museum - and so he was initially sold in the media as a jazz musician. The'Neue Blatt' soon wrote: "His career as a German jazz singer is unparalleled." Part of his image was that he was described in the same article as a "likeable boy". This arrived. 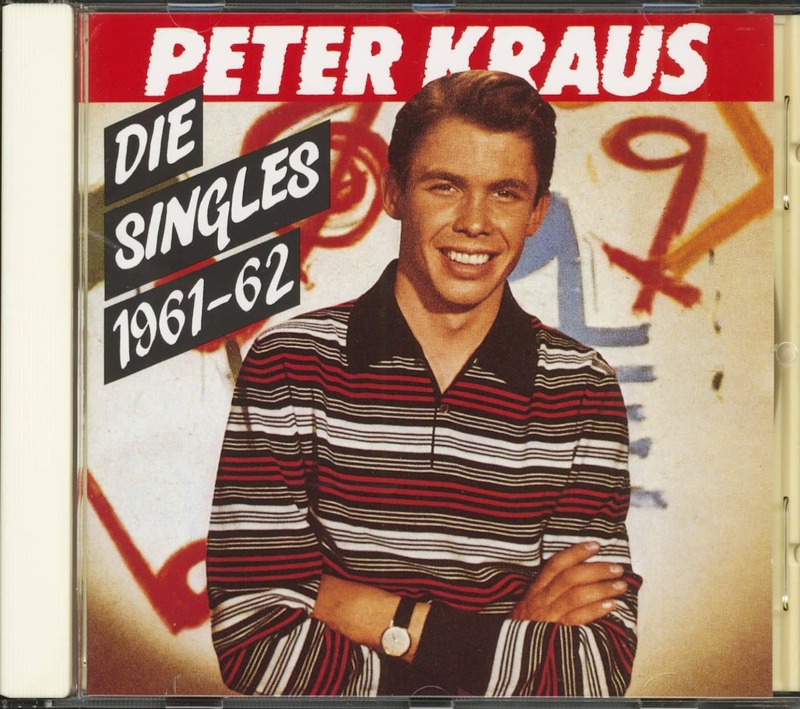 But Peter Kraus certainly didn't mind that the'Frankfurter Abendpost' called him the'Rock'n' Roll singer no.' and pronounced him the'German Presley'. So it made sense to record the successful Presley title Treat Me Nice (from the film'Jailhouse Rock') in the original arrangement with Peter Kraus-O-tone. 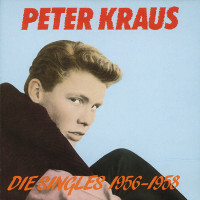 Customer evaluation for "Die Singles 1961-62"